The initial CT images suggested a subarachnoid bleed, but subsequent magnetic resonance (MR) imaging and an MR angiogram did not reveal any obvious aneurysm or bleeding. Upon neurosurgical consultation it was decided to treat the patient’s case conservatively as a grade ISAH and initiate rehabilitation. While on the neurorehabilitation ward, the patient sustained a trivial fall, resulting in cerebrospinal fluid (CSF) rhinorrhoea. The facial bone x-ray and CT head scan did not reveal any obvious fracture or abnormality. Though the CSF rhinorrhoea settled, the patient deteriorated and developed frontal lobe signs. 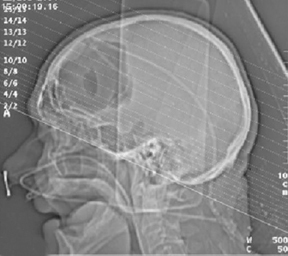 A thin-slice CT scan of the facial bones revealed a frontal bone fracture (Figures1A, 1B, and 1D) and tension pneumocephalus (Figures 1C and 1E). He underwent an emergency right frontal sinus repair and external ventricular drainage of tension pneumocephalus. A postsurgical CT scan revealed further worsening of the tension pneumocephalus,and an aventriculoperitoneal shunt was inserted to relieve the tension pneumocephalus. The incidence of tension pneumocephalus following a trivial fall is not reported in the literature; this is apparently the first reported case of a tension pneumocephalus following a trivial fall. The presence of air within the cranium is usually due to communication with the atmosphere or to a paranasal sinus. Tension pneumocephalus is a life-threatening condition that very rarely can occur secondary to meningitis1-3 or as a complication following neurosurgery.4-8 It may also occur as a result of falls; the dura mater may serve as a unidirectional valve that, in this case, could have contributed to air entrapment in the skull, causing a midline shift and tension pneumocephalus. 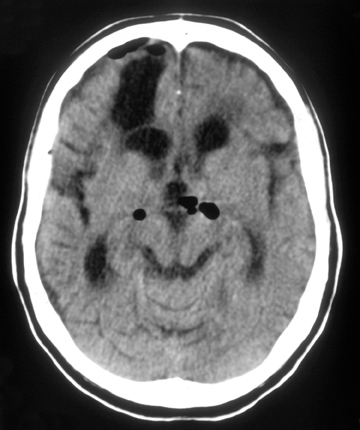 It is not completely clear why this patient developed frontal lobe signs despite normal CT findings at the time. CT is the modality of choice for the investigation and diagnosis of pneumocephalus. Any elderly patient showing signs of raised intracranial pressure or focal neurological signs should be scanned immediately with CT. Tension pneumocephalus is a neurosurgical emergency requiring immediate assessment. From the imaging point of view, this case highlights the diagnostic challenges faced by clinicians and radiologists. MRI in these difficult cases would spot the acute fractures early, but the neuroradiologist should have a high index of suspicion and use MRI judiciously to get conclusive evidence. Patients following shunt insertion are at increased risk of aspiration pneumonia.6-8 Mortality trends in these patients are not available, as this condition is very rare. With the advent of MRI and MRA, the diagnosis and grading of SAH can be performed more readily. Thus, early enthusiasm for the surgical management of SAH has subsided, and a more conservative approach has been adopted in low-grade SAH with stable and nonprogressive neurological deficits. 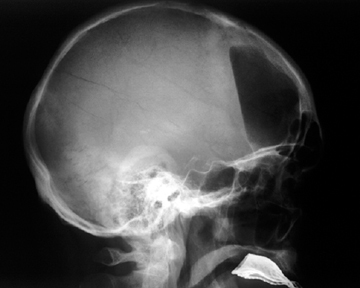 Facial bone fractures are best diagnosed with thin-slice CT and should prompt clinicians to think along these lines while investigating these cases. We present a patient who developed tension pneumocephalus following a trivial fall during neurorehabilitation. The pneumocephalus resolved after a ventriculoperitoneal shunt was inserted. The authors emphasize that a high index of suspicion is needed to diagnose such a rare complication, especially in elderly patients. Zasler ND. Posttraumatic tension pneumocephalus. J Head Trauma Rehabil. 1999;14:81-84. Chan YP, Yau CY, Lewis RR, Kinirons MT. Acute confusion secondary to pneumocephalus in an elderly patient. Age Ageing. 2000;29:365-367. Willheim K, Jurjevic A, Tomic Z. Pneumocephalus as a complication of metastases and eroding infection in the sacral region. J Neurol Neurosurg Psychiatry. 1998;64:136-137. Markham JW. The clinical features of pneumocephalus based upon a survey of 284 cases with report of 11 additional cases. Acta Neurochir. 1967;16:1-78. Walker, FO, Vern, BA. The mechanism of pneumocephalus formation in patients with CSF fistulas. J Neurol Neurosurg Psychiatry. 1986;49:203-205. Ikeda K, Nakano M, Tani E. Tension pneumocephalus complicating ventriculoperitoneal shunt for cerebrospinal fluid rhinorrhoea: Case report. J Neurol Neurosurg Psychiatry. 1978;41:319-322. Gonzalez Moles D, Mezzadri JJ. Postoperative fourth ventricle tension pneumocephalus J Neurol Neurosurg Psychiatry. Jun 1992;55:511-512. Candrina R, Galli G, Bollati A. Subdural and intraventricular tension pneumocephalus after transsphenoidal operation. J Neurol Neurosurg Psychiatry. 1988;51:1005-1006. Lakhani RS, Shibuya TY, Mathog, RH, et al. Titanium mesh repair of the severely comminuted frontal sinus fracture. Arch Otolaryngol Head Neck Surg. 2001:127:665-669. Braun V, Rath S, Antoniadis G, et al. Treatment and outcome of aneurysmal subarachnoid haemorrhage in the elderly patient. Neuroradiology. 2005; 47:215-221. Tension pneumocephalus secondary to a dural tear. Appl Radiol.